Can you confirm these amateur observations of Xenosaurus grandis? Comment Subspecies: Xenosaurus grandis agrenon, rackhami, arboreus, and sanmartinensis have been elevated to full species status. King and Thompson (1968) reported intergrades between X. g. grandis and X. g. rackhami from several localities in north-central Oaxaca. Distribution: see map in WOOLRICH-PIÑA & SMITH 2012. Type species: Xenosaurus fasciatus PETERS 1861 is the type species of the genus Xenosaurus PETERS 1861. Xenosaurus PETERS 1861 is the type species of the family Xenosauridae. Etymology The generic name is derived from the Greek words xenos, meaning "stranger or guest" and saurus, meaning "lizard." 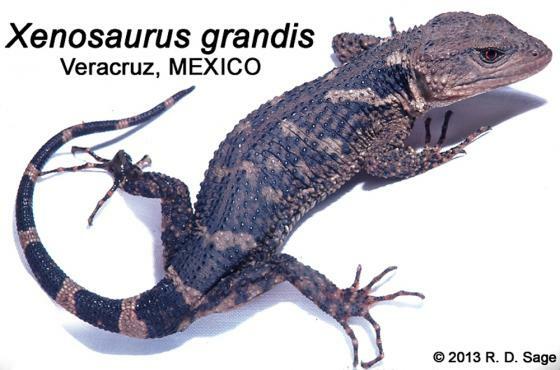 When this lizard was discovered, the name presumably was applied in reference to its odd appearance, compared to that of other lizard species in the area (Lemos-Espinal & Dixon 2013). Phillips, C.A. 2003. HERPETOLOGICAL TYPE-SPECIMENS IN THE UNIVERSITY OF ILLINOIS MUSEUM OF NATURAL HISTORY: AN UPDATE TO THE PRIMARY TYPES. [type catalogue] University of illinois Museumof Natural History, 17 pp.